This book examines how the soldiers of 1642 expected to light the Civil Wars; and how experience changed their ideas. The work of theorists who wrote before, during and after (he war has been studied, along with the experiences of those who fought in the wars. Unfortunately, few 17th century soldiers wrote memoirs, and those who did sought only to defend or advertise their own actions. Despite new research, many books still reproduce Victorian illustrations of "Cavaliers and Roundheads' without question. The colour plates that appear in this lx>ok challenge many preconceived ideas. Their technical and artistic merit ii due to Angus McBride, but I take responsibility for their conception and any mistakes therein. I would like to thank all the contributors to the magazine English Civil War jYoUl & Queries who provided invaluable information which helped to shape this book. I must also acknowledge my debt to Gail, who has transformed the text into readable English. Readers may care to note that the original paintings from which the colour plates in this book were prepared are available for private sale. All reproduction copyright whatsoever is retained by the publisher. All enquiries should be addressed to: Scorpio Gallery P.O. Box 475, Hailsham, E. Sussex BN27 2SI. The publishers regret that they can enter into 110 correspondence upon this matter. At ill«- start of the Civil War many cavalry officers turned to military books to discover how to conduct the economy and operations of their units. 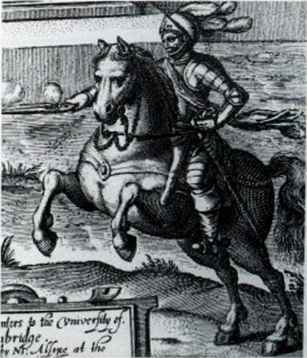 Robert Ward's Animadversions of wane ; 1639)—the title means critical observations on war- -was highly thought of for its advice on the training and handling of cavalry; but it owed much to what was by far the most popular book. John Cruso's Militarie Instructions for the Cavallcrie. I'his was first published in 1632, but was reprinted in 1644 at Cambridge, the heart of the Parliamentarian Eastern Association. Many books were revived and republished to meet the new market generated by the Civil Wars, but such was the dominance of Cruso's book that few-others dealt with cavalry. Cruso based his advice upon his own experience in training the Norfolk militia, but also looked back to the works of earlier theorists. Although Cruso's book was written in the year that Gustavus Adolphus died, it contained nothing of the new offensive cavalry tactics practised by the Swedish army. In 1644 John Vernon published the pamphlet The young Hone-man. 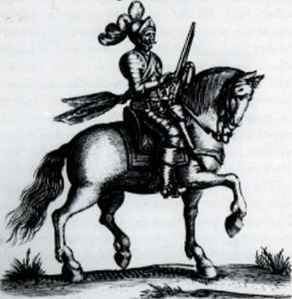 or the honest plain-dealing Cavalier ('young' meaning inexperienced; and 'Cavalier' indicating a horseman). This was intended to up-date Cruso in the light of two years' experience of the war. rather than to replace his work. In his book Military Discipline: or tfu young artilleryman, William Barriffc stated that he had not touched upon the subject of cavalry because Cruso had said all that there was to say on the subject. 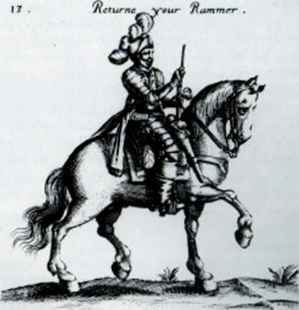 Despite running into five editions from 1635, it was not until the last, published in 1661, that a section on cavalry entitled Some Brief Instructions for the Exercising of the Horse- Troopes was added by J.B., and this still owed much of its content to the works of Cruso and Ward, which it recommended to its readers. Cruso divided cavalry into five types: the lancer, the cuirassier, the harqucbusier, the carbine and 1 he dragoon. The lancer had disappeared from European armies, except for the Scottish border lancers, who rode small horses and were unarmoured. They therefore lx>re no resemblance to the knightly warriors described by Cruso. break ihcir formation. The cuirassier, a heavily armoured horseman equipped with two long-barrelled pistols, a sword and a pole-axe, came to replace the lancer. 1'he dominance of the cuirassier was to l>e short-lived, for the increased use of the musket, in place of the lighter caliver, meant that the heaviest armour could now be pierced by shot. By 1639 the cuirassier's armour was no longer considered worth the cost and discomfort involved. Sir Edmund Verney, when serving against the Scots, wrote asking to be supplied with lighter armour, 'for it will kill a man to serve in a whole Curass'. The only know cuirassier units to see action in the Civil War were the bodyguard troop of the Earl of Essex, and the regiment of Sir Arthur Haslerigge. These were the only Parliamentarian horse to hold their own against Prince Rupert's Horse in the early stages of the war. Haslcrigge's regiment was almost destroyed at the battle of Roundway Down, and the cost of re-equipping the unit as cuirassiers may have proved 100great, for a troop from the retfiment are later rrterred to as harquebusiers. 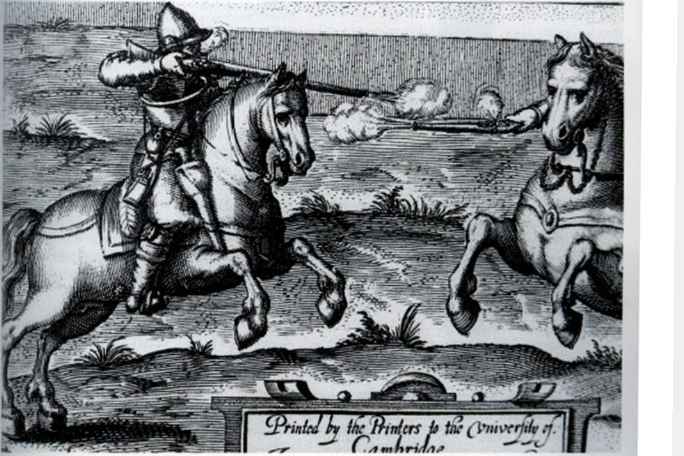 In the iClh and early 17th centuries the fashion for horsemen armed with firearms had led to several new varieties ofcavalrymen being created. The role of the harquebusier, pctronel and carbine was to provide flanking support for the more heavily armoured cuirassier. During the Civil War only the terms carbine and harquebusier survived. and these were used interchangeably to describe the standard cavalryman. The cavalry regiment that Parliament had intended to send to help quell the Irish rebellion was to have consisted of ten troops each 60 men strong besides officers. At the start of the Civil War both armies formed troops of horse 60 strong, but variations appeared due to the success or failure of individual captains. Thiii picturr from Grafto nhowt the training of a lancer Co ilrilr at variow* part« of a Hor**man'a or foot toWirr'n body, firearm* required little »kill or training compared «o ikf Ufeloa| practice needed to miner the heavy medieval hat*. every (x> men recruited into a troop by this means. When the Parliamentarian army mustered for the start of its first campaign, orders were issued that only troops with 40 or more men should attend; the remainder were to finish recruiting quickly, or would be broken up to strengthen other troops. At the battle of Edgehill on 23 October 1642 the Parliamentarian troops, which had not yet been properly organised into regiments, were probably close to their notional strengths of 71 men (Go troopers plus officers and office holders). By December 1642 Cromwell was in command of a troop 80 strong, and there was a gradual increase in the size of Parliamentarian horse troops. The average strength of the troops serving with Essex at Tiverton in 1644 was 85 men, although ibis varied — there were two troops which boasted too men, and one which mustered only 44. 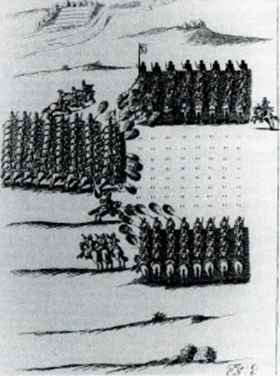 Parliament's regional armies had more difficulty in maintaining the strength of their regiments: the eight troops of John Frescheville's northern horse regiment averaged only 20 men each during 1644. Many troops of the Eastern Association approached 100 strong and this was the strength set for the New Model Horse | although it was reduced to 80 in the reforms of 1648). ■ urn troop, and then make a whole turn again. & so give advantage «o ><'«r enrntic'. men besides officers, whereof 20 of them gentlemen that bore arms'. troopersj and the New Model having a standard of mx. In the army of the Eastern Association, Cromwell commanded 14 troops, the Earl of Manchester 1 1. Charles Fleetwood six. Quartermaster General Vermuyden five and Sir John Norwich a mere three. The most prominent Royalists also maintained large regiments-Prince Rupert's regiment contained ten troops in addition to his 150-strong Lifeguard. In battle, two troops were often combined to form a division or squadron; however, care must be exercised over these terms, as John Vernon divides a single troop into three 'squadrons'. The field officers of a regiment of horse were a colonel, a lieutenant-colonel (only in the Royalist army and in larger Parliamentarian regiments) and a sergeant major. Each troop consisted of a captain, a lieutenant, a cornet (standard bearer), a quartermaster, three corporals, two trumpeters, a clerk, a saddler, a surgeon, a farrier, and—in theory—60 troopers. 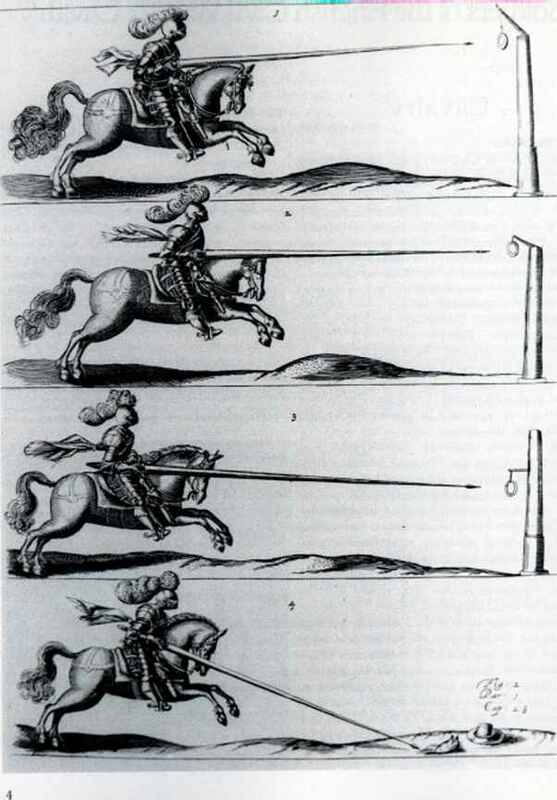 Providing horses for the cavalry was to be a major problem throughout the Civil Wars, and several methods were employed to find suitable mounts. Many cavalrymen were recruited with their own horses. If such a horse was killed in action or died of disease a replacement was, in theory, provided by the authorities; but alter several years' service it could be difficult to determine to whom a horse belonged. For those who could not provide their own mounts, Parliament sought horses as voluntary- contributions from its sympathisers. Each horse was valued, and interest was paid at 8 per cent until the horse, or its estimated value, was returned. In addition the owner was paid -}d. per day hire for his horse, and as. fid. if both horse and rider were provided. As the early enthusiasm for the war waned voluntary contributions became increasingly scarce, and Parliament adapted I lie system to raise compulsory contributions. On 25 July 1644 Parliament ordered 15 counties to raise 6,500 horec and to deliver them to a list of colonels of horse regiments by given dates. A popular method of gaining horses was to take them by force from those who supported the enemy. On 1 April 1643 Parliament passed a 'sequestration ordinance' which allowed the horses of'delinquents' to be seized without compensation. This licensed banditry had a damaging effect both on the discipline of the armies and upon the stability of the community. Stories of bribes paid to protect delinquents and of false accusations by jealous neighbours were common, and the fear of confiscation did nothing to promote the breeding of horseflesh. It is likely that in many cases armies look what horses they needed and justified thrir actions only if their victims had the influence to complain to King or Parliament. 1645 paid £7 1 os. for its cavalry mounts and £4 for those of dragoons. Cruso described how to prepare a cavalry cfiargcr lor battle: 'When ho is at his oats (at a good distance from him) a little powder may be fired, and so near to him by degrees. So may a pistol be fired some distance off. and so nearer: in like manner a drumme or trumpet may be used. The groom may sometime dressc him in armour, and he may be used (now and then) to eat his oats from the drumme head. It will be very uscfull sometime to cause a musketier to stand at a convenient distance, and both of you to give lire upon ihe other, and thereupon to ride up close to him: also to ride him against a compleat armour, so set upon a stake, that he may overthrow it. and trample it under his feet: that so (and by such other means) your horse (finding that he recciveth no hurt) may become bold to approach any object'. 'In our late Civil Wars in England... the Chief Commanders in their Exercising of an Infant Troop (such a one as hath been newly raised) did Customarily draw them forth by Ranks, that they might place the best Men and Horse in the Front; the second sort in the Reer, and the third in the middle Rank; and so instead of 8, 6, or 5 in a File, they had but 3: and that for this reason,(besides others that might be given) Because their Front extended larger, and brought more hands to Fight: For a Troop of 64 Horse of 8 in File, brought but 8 in Front; the same Number of 6 deep could not compleat 11 in Front, there wanting a: And that 5 deep, did not afford 13 in Front, there wanting 1; Whereas this Number, drawn up 3 deep, affords a front of 21, and one I over; So that One Troop of 3 in File, was more serviceable, (in bringing hands to Fight) than t\»x) I Troopes and an half was, that had 8 in File'. m have the distance between rank and rank (both for the length of the horse, as also for the space between horse and horse) to be six paces, & one pace between file and file. Yet, if we take every per for five foot (as that is the usuall dimcntion) by this rule they should be at a verie large distance'- However, when Cmso published his translation of Praissac in 1639, he added a marginal note at this point in the text: "Paces hero are to be understood Steps, and not geometricall paces of 5 foot'. There was general agreement that six feet, or the length of one horse, should be left between the ranks 1 i.e. the rear of the front horse and the head of the horse standing behind it). This distance was known as 'open order'. 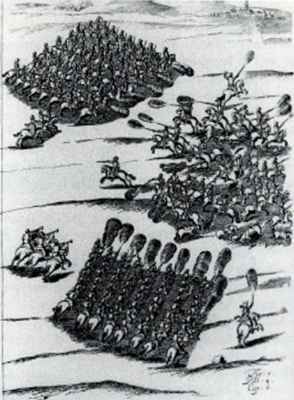 Three feet, known as 'close order", was recommended as the distance for horse« standing side by side; but Monk calls this 'order' and recommends that a charge be made in a "close order' of one and a half icet between hom-s. With such confusion amongst the theorists, the cavalry general could find each of his units employing different formations depending upon which book their officers had read. Only the experience of war, or a strong-minded commander, could impose uniformity of'drill on an army. A har<|urbu<t»er gives fir» wilh a whcellock carbinr which is carried on a narrow carbine bel(. Hr kit his bullet pouch and powder fl»li suspended from a waisl bell.